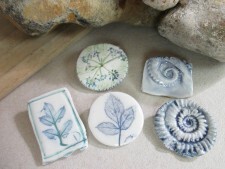 These are delightful porcelain brooches, by Rose Dickinson in Faversham, who works in porcelain and uses flowers, seed heads and seashells to emboss and design her beautiful ceramics. 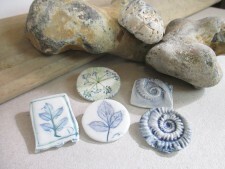 Here is a selection of brooches with either flower or seashell designs. 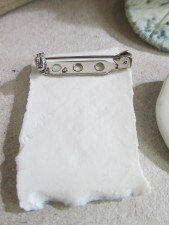 Each has a pin attached and unglazed back to the brooch, as you can see in the picture. Please choose which of these specially selected brooches that you would like to receive. The brooches are around 3 - 4cm across.